We have found what we think is one of the best ways to avoid high mobile device roaming costs in France. It’s called TravelWiFi. Simply put it’s a personal, rechargeable mobile hotspot that you can connect 10 devices to, and you can pick it up at our depot! 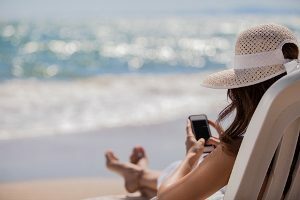 When you travel to a foreign country with your mobile phone or device, you are roaming – your provider back home and the one in the foreign country work together to keep you connected, so you can make and receive mobile phone calls, write text messages, surf the web and download content. But all that great stuff comes at a high price, particularly if you come from out of the EU area. TravelWiFi allows you to keep your own phone number, you don’t have to go searching for an Internet connection and you won’t pay roaming charges every time you go online. How much is it? There is a per-day charge plus a refundable deposit of €150. The longer the rental period the lower the per-day cost. It starts at €15 per day for two day’s rental and drops to €6 per day for rentals of 30 days or more. You will have unlimited data and remember that 10 devices can be connected to it. TravelWifi says the connection – provided by Bouygues Telecom – is “ultra-fast” if you have 4G. If 4G is not available in the area you are visiting, you will be connected to the 3G+ or 3G network. A map here shows you what their coverage is like. You can pick up the hotspot at the company’s Paris office or at Charles de Gaulle Airport, Orly Airport, Versailles, and the Galeries Lafayette in Paris, or you can have it delivered to our depot ready to pick up when you arrive here. To find out more visit the TravelWiFi website. EU-based customers with phones registered in the EU now benefit from an all-out ban on EU roaming costs which came into effect in 2017.